This is the interior of an urban palace in La Paz, one of the major cities in the Andean highlands and today the capital of Bolivia. While spaces like these were constructed for wealthy patrons, they were occupied by a wider range of classes, including servants and poorer relations. The rooms of this elegant house open inward, onto this impressive patio, viewed from the top story. The rhythm of the interior arcade is repeated on the exterior of the building, where a similar arcade dominates the second-story façade. Unusual in this domestic space is the presence of a large triumphal arch on the stairway. Such arches were more frequently found in church architecture. The man who commissioned this house, Francisco Tadeo Díez de Medina y Vidango (1725 - 1803), was from a wealthy family and inherited the lot adjacent to La Paz’s main plaza from his father. He held political office in La Paz during one of its greatest crises—the siege laid to the city by Tupac Katari (also called Julián Apasa)—an Aymara Indian who led an indigenous rebellion. Díez de Medina’s diary for the period is one of the most invaluable eyewitness accounts of life during the insurrection. When Tupac Katari was captured in 1781, it was Díez de Medina who sentenced him to death by quartering—a fate that his fellow rebel leader, Tupac Amaru, met as well. The building is largely made of blocks of cut stone. Some of it was carved into decorative motifs. Its artisans were likely native Andeans. Since similar carving techniques are found in La Paz’s churches, they may have undertaking both sacred and secular commissions. During its life, the house was converted into a hotel, then a casino, and then split into private dwellings. In 1960, the Bolivian government began restorations on the house to convert it into its present incarnation: the National Museum of Art. 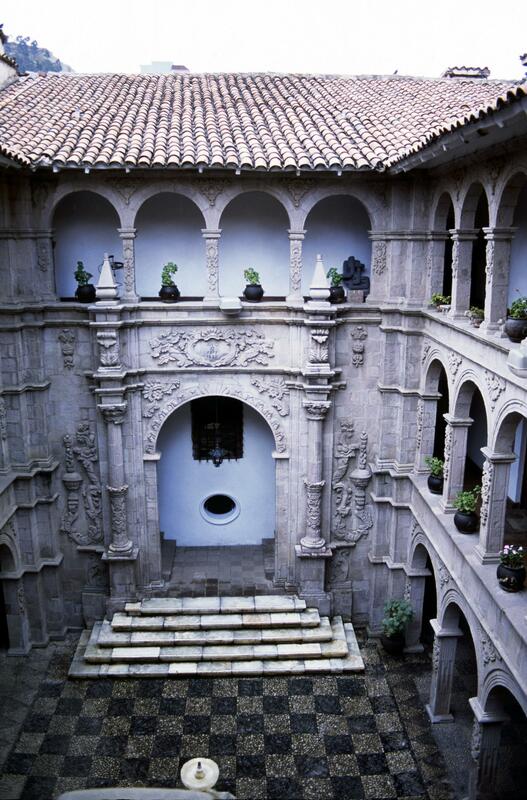 This house shares many of its features with other elite houses in Spanish America, be they in Lima or as far away as Mexico City, including its elegant stone carving and spacious central courtyard with surrounding galleries of rooms. 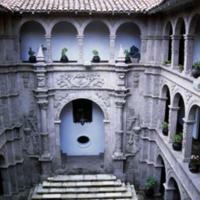 Such architectural forms point to widespread patterns of elite life throughout Spanish America. Díez de Medina, Francisco Tadeo. 1981. Diario del alzamiento de indios conjurados contra la ciudad de Nuestra Señora de La Paz, 1781. M. E. del Valle de Siles, ed. La Paz: Banco Boliviano Americano. Thomson, Sinclair. 2002. We Alone Will Rule: Native Andean Politics in the Age of Insurgency. Madison and London: University of Wisconsin Press.